The Pound gained some ground yesterday after EU leaders and the UK agreed to a “flexible extension” of the Brexit deadline until October 31, which PM May has accepted. In addition to that, the UK will have rights to vote on the EU election and can propose their candidate as well. While a Brexit deadline extension is a good news for the Cable, the market sentiment isn’t bullish yet, as traders now await details of how the opposition Labour party reacts to the PM May’s victory without having no plan on hand. Negotiations are to continue today when the PM returns from the EU summit. In economic news, the UK GDP and Manufacturing Production surprised everyone by jumping above market’s expectations, boosting the Pound higher. No relevant data coming out from the UK today. 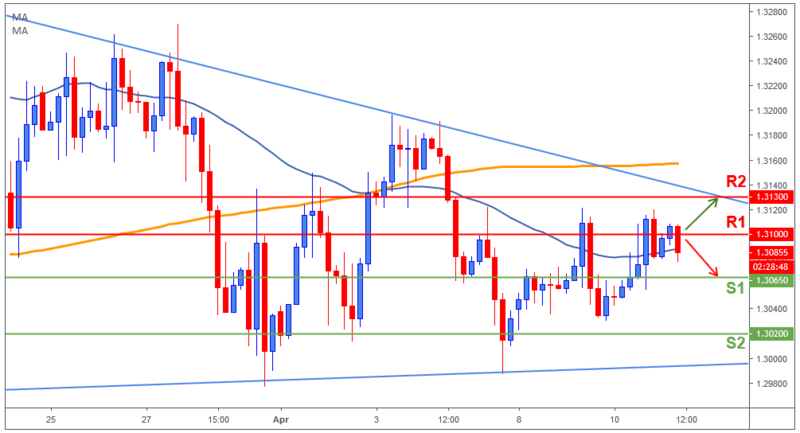 The Pound broke above 1.3065, previous resistance turned new support, as the bulls challenged to break above the 1.31 (R1), but the bears weren’t easy to beat. Currently price is sitting just above the 50-day moving average (blue line), attempting to gain momentum, retest 1.31 (R1) and possibly break it this time. If the bulls were successful, then price could be heading towards 1.3130 (R2) where we can also find the short-term bearish trend line. However, any break below 1.3065 (S1) could take price to revisit the 1.3020 area.